Daily Round-Up: Lucky 7! July 7th, 2011. 7. 7. 7. 7. 7. 7. 7. Pretty good day for me too. Anyway, off to the round-ups, you lucky people! 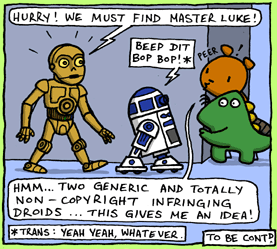 The Moment: Major ISPs give users “six strikes” for copyright infringements. It’s an interesting idea, and the move that everybody can really agree to. The idea is simple – Copyright holders will continue to look for copyright infringements on torrent sites and other sites on the Web. Major internet providers will continue to give their customers privacy so ISPs won’t have to supply copyright holders with information on copyright infringements unless the Court requires them to. In a meanwhile, copyright holders will “ping” ISPs with notice if they see users on the network downloading/uploading any copyrighted work without permissions. Users will get First and Second notice as a warning via e-mail that directs them to know more about the copyright issue. Users will get third and fourth notice the same way, except they will be in the more noticeable forms such as pop-up alerts. Fifth and sixth notice will bring “mitigation measures,” which include throttling, forcing violators to visit landing page that tells violators to settle the matter with the ISP and others. This doesn’t stop people from spoofing IP address, or jumping from ISP to another ISP to avoid any trouble with the violation. But if ISP can act in a reasonable way (they can’t cancel your internet service or prevent you from sending e-mails or consulting with doctors online so that’s a start), this can be a better way than suing the heck out of everyone to get money that they will probably never fully get to begin with. “My Bold, Cold, Bald Picks”: This will increase piracy short-term, but will eventually lead to more reasonable relationships between content consumers and creators. Given that even reaching sixth strike has a light consequence, it’s not hard to imagine people moving more toward piracy since they don’t have to worry about getting sued by MPAAs and record companies. But in a more factual way, people who usually pirates software or contents separate into two groups: Those who actually buy a lot more content than those who don’t and those who are too poor to buy legal contents anyway. For the first group of people, one study revealed that people who pirates download 10 TIMES the amount of music downloaded by people who don’t pirate. Piracy actually exposes people to more musics and artists, eventually pushing people to legally buy albums and singles of artists that they gave a listen via torrents. For the second group of people, teens are main factors in piracy. It’s partly because they’re more tech-savvy but mainly because teens usually get a little allowance. A lot of teens have a very fickle musical taste and listen to songs that are “hot,” which changes almost every week. With little allowances that they have, they cannot buy all songs that they want to put on their iPods and iPhones. So what do they resort to? Piracy. Same thing applies to most of the contents that are pirated such as movies and games. So, two groups of people who pirates are either those who will not buy legal contents, or those who already buy enough legal contents. This means content creators really have a little need to crack down on piracy. While I don’t advocate for the full-on legalization of piracy, relaxing on piracy probably will also cut the consumer backlash MPAAs and RIAAs of organizations get when they sue ordinary people for millions of dollars just because they uploaded couple songs. Facebook Vibe seen, music service coming to Facebook? This really makes Facebook look like MySpace now. Steve Ballmer will deliver CES 12 keynote. Perhaps with the sneak peek of Windows 8? Rumor says that Windows 8 will be released next April anyway. Apple loses “appstore” copyright lawsuit against Amazon. Judge declares Apples’ App Store not famous enough, or renowned, or prominent. App Store is not famous enough, and Kim Kardashian is? Swype on iOS. Only if you are jailbroken. There’s a reason to try JailbreakMe. iAD facing competition as competitors woo companies. Seriously though, million dollar fees to start iADs are way, way too high. Virgin Mobile’s $ 25 unlimited data/text, 300 minutes plan will have a price hike to $ 35. Still one of best deals you can get if you’re using a smartphone. Especially when a competitive plan for Verizon costs close to $ 130. App Store hits 15 billion downloads, and $ 2.5 billion given to developers. Android Market just hit 5 billion last week, so there’s your bar right there, Android. Government arrests 15 people from Anonymous. Five of them are under 18. That’s some hot young IT prospects right there… In a meanwhile, AntiSec is hacking more organizations. This hacking spree just won’t stop! Sony will include “PSN Pass” in first-party games, which links PSN account with the game CD. This bans people who bought used CDs to play online games, although I’m pretty sure people will find a way. Investors accuse RIM of using the split of CEO/Chairman as a “stall tactic” to prevent them from suggesting more changes. The company is falling apart on the outside and on the inside. In brief: Toshiba Thrive in stock for $ 430…Verizon already controls 32% of iPhone 4 data usage in the U.S….Xoom may get Android 3.2 which nobody knows what it is (Ice Cream Sandwich should be 4.0)…SpongeBob Twitter Adventure! More cheaper iPhone rumor…Apple releasing Lion on July 14th?..2Pac Albums on iTunes! Happy 7/7 day and good night! Oracle looks to grab $ 20 from every Android handsets sold, Android may become the most expensive OS to license. According to rumors, Oracle is looking to grab $ 15 – 20 from every Android handsets sold. This comes from the litigation by Oracle, which sued Google last year for violating patents in Android OS. USPTO found most of Oracle’s complaints invalid, with five of seven patents already declared fully or partly invalid. So, this news comes even at a more surprising time. With 100 million Android handsets already sold and 500,000 new activations every day, money adds up quickly. If the court sides with Oracle in the Oracle-Google case, Oracle can see as much money as $ 10 million from Android handset manufacturers every day. That adds up to $ 3.65 billion every year. It’s unlikely that Oracle will get that much amount of money. Oracle itself stated that experts see the company winning much as $ 2.6 billion from Google, which was the number Google quickly dismissed. It’s also possible that this lawsuit may drag on for years, just like much of patent lawsuits today are. Given the big stake of this lawsuit, either company will look to appeal to the highest court possible. But this underlines the difficulty of being Android handset manufacturers. Microsoft also is the big player in grabbing money from manufacturers. The company already signed a deal with HTC that give Microsoft $ 5 for every HTC Android handsets sold (which ironically makes Microsoft more money than licensing fees Microsoft got for Windows Phone 7). Microsoft is also looking to sign a deal with Samsung that will give it $ 15 for every Samsung handsets sold. Rumor is that Samsung declined to pay $ 5 per handset fee so that Microsoft increased the fee, but $ 5 or $ 15, it’s still very significant money for manufacturers whose profit margins are already very thin. Typical smartphone costs around $ 180 to make, but combined with a shipping/retail/development cost, the cost skyrocket, hence the exorbitant money to buy an unlocked cellphones. For instance, typical smartphone manufacturers have a gross income ratio of around 30%, but operating income (which counts employees’ wages/upkeep of retail stores/etc as deficits, which a gross income ratio doesn’t) hovers around 10%. For instance, HTC sold close to 12 million smartphones at an average price of $ 360 (which went down by $ 30 year-to-year due to manufacturers’ race to create entry-level Android smartphones). With operating income at 15% for HTC, HTC makes $ 55 for every Android handsets that they sell, which adds up close to $ 700 million in operating income. However, in addition to Microsoft payment, if HTC have to pay $ 15 to other manufacturers in patent settlements, the profit will decrease to $ 500 million, more than 25% decrease in the HTC’s profit. Sure, HTC can survive. Samsung can survive. But they would look toward manufacturing phones for other operating systems if they have to pay more for Android than they have to for other OS. This creates a huge opportunity for Windows Phone 7, which only asks manufacturers to pay $ 15 and gives manufacturers a united, clean, smooth operating system in return, as well as for the WebOS, which is one of the best mobile operating system on the market today. What this move also does is that it discourages manufacturers specialized in creating budget smartphone from creating Android handsets. As much as ZTE Blades and Optimus Ones were sold, $ 10 ~ 20 licensing fee will make those sub-$ 200 smartphones loss leaders, since manufacturers can only go so far in cutting costs. This significantly undermines Google’s plan of spreading Android into becoming a de facto OS for cellphones just like Windows OS. Google, which makes 90% of money from ad revenue, will be significantly affected by budget users moving away from Android and choosing other operating systems, which may feature different search engines such as Bing, or even go back to feature phones, significantly reducing the reach of Google’s mobile ad service. Of course, the question is will Google let that happen? Nortel auction, which Google wasn’t even interested in winning, didn’t seem to show that Google was willing to grab patents that may allow it to defend itself against patent lawsuits. Instead of Google, we have seen manufacturers stepping in, with HTC buying S3 Graphics and Samsung counter suing Apple for violation of its patents. But if Google fail to act in any way, it’s hard to see how manufacturers can stand paying $ 10 ~ 20 for every handsets that they sell if they can go to other, better operating system that make you pay less. The Moment: HTC (Sort of) buys S3 Graphics for $ 300 million. The important thing to consider here is that HTC and VIA, which had a joint venture with S3 Graphics, are owned by the same owner. Also, HTC chairperson, Cher Wang, is a major shareholder of S3 Graphics. But as symbolic as this move can get, it’s significant. Although it’s far from final (the final decision is scheduled to come November), initial ruling from ITC ruled that Apple has been infringing on two of S3 Graphics’ patents. This, itself, can stop the sale of Apple’s iPhones and iPads in the U.S. But this buyout further increases the importance of ITC’s ruling if ITC rules against Apple. As many know, HTC has been in a lawsuit with Apple for more than a year, with no end in sight. There was an initial complaint filed by Apple, who sued HTC for violating 20 patents such as “unlocking a device by performing gestures on an unlock image” (think “swipe to unlock”). And there was a counter suit filed by HTC, accusing Apple of violating five patents. Administrative judge Carl Charneski will make his decision on those initial lawsuits on the August 5th, which is also the date that Apple requested a hearing for preliminary injunction against Samsung (What a busy day!). While it’s unlikely that those patents from S3 Graphics will factor into lawsuits yet, given that the HTC/S3 merger have to be approved by the Taiwan government, it can create a further ground for more counter suits by HTC. HTC can use those patents to defend against Apple’s lawsuit if the case stretches any longer. Obviously, what most people and I think is that Apple will eventually sign cross-licensing agreements with every manufacturers that it has sued, so this buyout may even provide a better negotiation table for HTC if Apple drops its lawsuits. Another iPhone 5 rumor. Thinner and lighter. Zzzzzzzz. 25 million iPhone 5 may ship this year. Zzzzzzzz. By the way, second and third generation of iPod Touch were 8.4mm thin. Do you think iPhone 5 can be even thinner than that? iPhone 4 is only 9.3mm thin. Now you can jailbreak your iPad 2 on your Mobile Safari! I’m pretty sure people will do useful stuff with jailbreaking. Like I don’t know, widgets? iPhone 5 may come to Sprint. At least one analyst says so. I bet I can pay an analyst $ 1000 to say that iPhone 5 may come to Metro PCS. iPad 2 Plus, with a better display, may launch this year. Given that “retina” display on tablets are not even on the caliber of “retina” display on smartphones, not to mention much higher graphics processing power required to power a such high-resolution display, I doubt this improve the user experience greatly. Xoom 1 has been out for four months. Cue the Xoom 2 rumor! Now on FCC! Droid 3, with its Atrix spec and a 5-row keyboard, may launch with $ 460 unlocked price. Given that Droid 2 sells close for $ 370 unlocked on Amazon, this is a very good deal if the leak is true… In a meanwhile, rounder Droid Bionic! Speaking of Amazon, those with a paid Cloud Drive subscription will get a “limited time” to get unlimited storage for their music. Given how long it take to even upload 5 GB of music, I don’t know how long it would take to upload 100 GB of my music. WTO finds that China is violating WTO law because the country put a cap on export of rare metal. I don’t know China follows those kind of rules. iBooks may push iTunes revenue to $ 13 billion by 2013. Wait, I thought Kindle was still leading. Spotify comes to US. Get your invites… NOW! Taco Bell.. Free WiFi and in-store TV! Now I can stop go to McDonald for my WiFi fix. Free Power Rangers SMASH app for your iPhone! Evo 3D for $ 113 on WireFly! Droid Incredible 2 for a penny! Wi-Fi Xoom at $ 499…16GB of DDR3 Ram for $ 120! 4GB refurbished MP3 player for $ 25! Last day to lock up your unlimited plan for Verizon. Good luck with that (for those on East Coast, too bad!) and Good night! Droid Bionic launching on August 4th? Guys at AndroidCentral got the slide on Verizon’s next big Android launches and they give us a clearer picture of when we can expect those Droid handsets to make an impact. 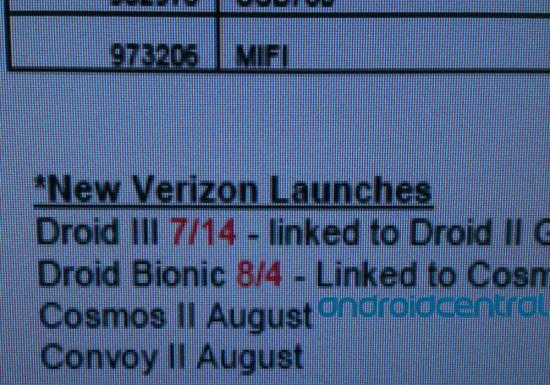 According to the slide, Droid 3 should launch in July 14th, which matches exactly with the general launch date rumored earlier. The previous leak also said that the device will be available on July 7th, a day after the end of unlimited data plans), for those upgrading, so we’ll see whether that sticks as well. Also, as guys from AndroidCentral said earlier, LG Cosmos II and Samsung Convoy II should be available this August, although there’s no news on new Blackberrys on this slide. But what is most interesting about the slide is that we finally got a clear date (which can be changed, given Motorola’s history of delaying this handset) on when the Droid Bionic, the handset with LTE and dual-core Tegra 2, a first for LTE phones, will launch. The handset will launch on the August 4th according to the slide, which means people who bought phones from Costco to lock in unlimited data plans can exchange their phones for Bionic, given the Costco’s generous 90-day return/exchange policy. 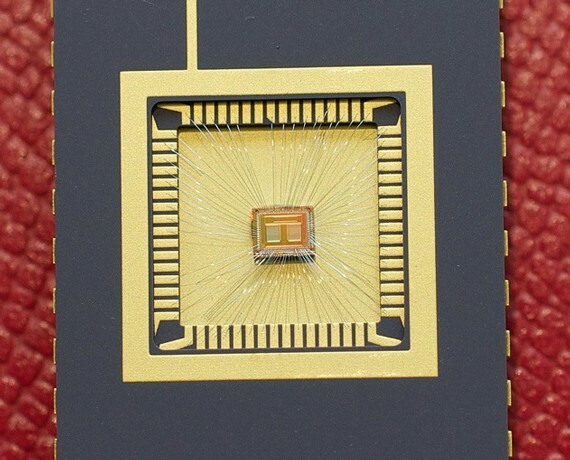 While Tegra 2 falls short in some aspects, it’s head and shoulders above CPUs that the current crop of LTE phones have, which range from Hummingbird seen in last year’s Galaxy S phones to second-generation single-core Snapdragons. So it’s exciting to see the first dual-core, LTE phone hit the market, as dual-core handsets can take more advantage out of lightning fast speed of the LTE network. Now, hopefully the date sticks. 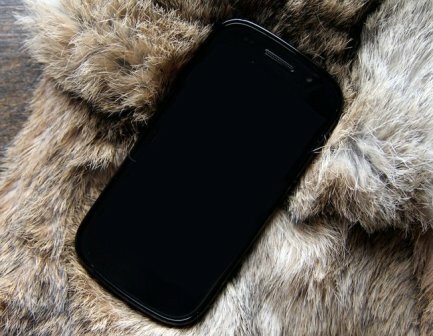 webOS slides leaked, phones launching in this fall? Guys at PreCentral got the confidential document from HP regarding webOS products, and it looks promising. According to the document, 64GB TouchPad will launch this August with a dual-core 1.5 Ghz processor from Qualcomm, used in Pantech’s Korean-only smartphone, Vega Racer. 64GB TouchPad will only be available in a “glossy white” version. In the Fall, we’ll see Pre3 and Opal, which is a 7-inch version of the TouchPad. Considering that Pre3 was slated to arrive this summer, a push back to the Fall is extremely disappointing both to consumers and the company as well. However, this has one positive effect of lengthening the lifespan of Pre 2.